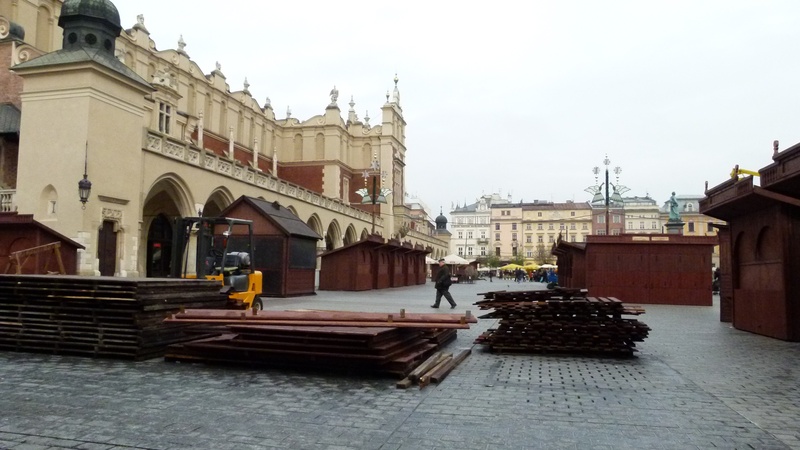 Polish – the third most difficult language in the world? When flying to Poland, my neighbor told me that a recent evaluation rated Polish to be the third most difficult language in the world. I could not find that ranking. I found this quote: “Polish grammar has more exceptions than language rules… Furthermore Polish people rarely hear foreigners speak their language, so… pronunciation must be exact or they will have no idea what you are talking about” (most difficult language to learn). Is really everything so difficult? What about pantofle? 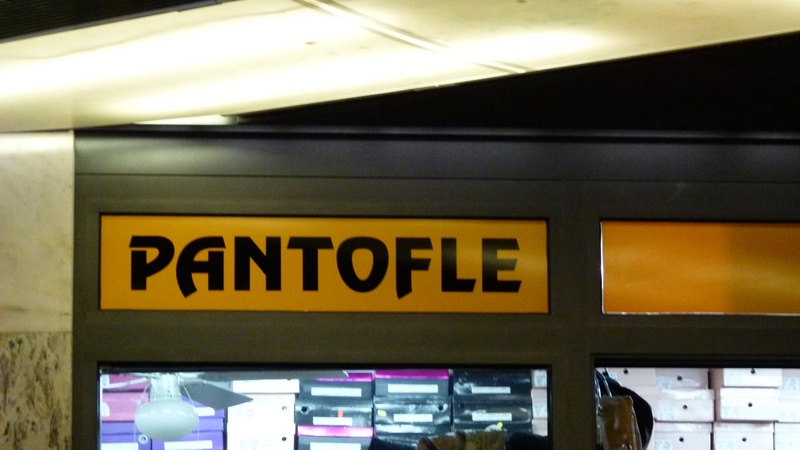 A German speaking Swiss easily recognizes “Bantoffle” and people of French mother tongue understand “pantoufles”. These are slippers. 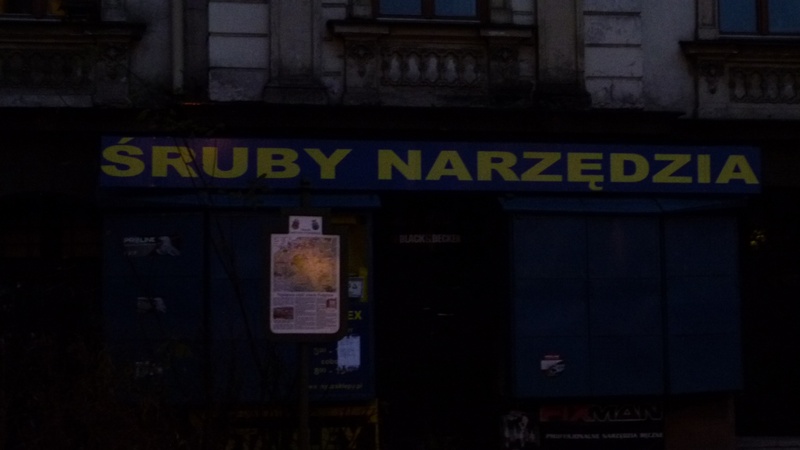 Or what about “sruby”? Absolutely clear to anyone from The German speaking part of Switzerland: These are Schruube (screws) and in the Bernese Alps they are called exactly like in Polish… Schruubi. And what about “obuwie”? Any Russian understands, what he can buy here… обувь or shoes. 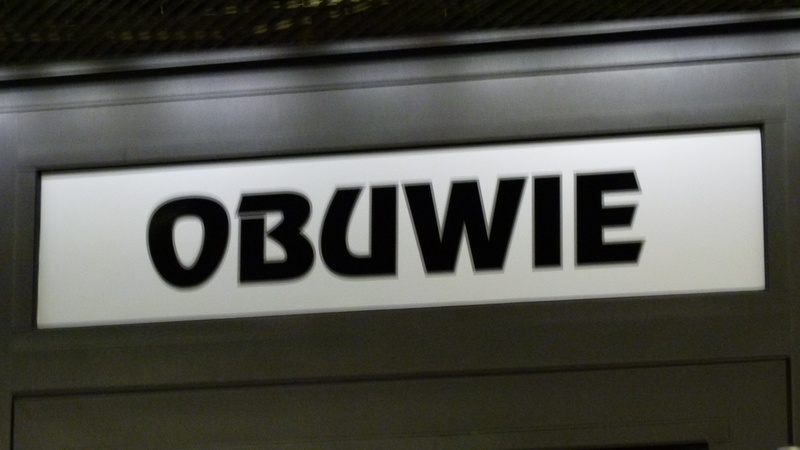 But most Polish words look frightening – can this be pronounced at all? 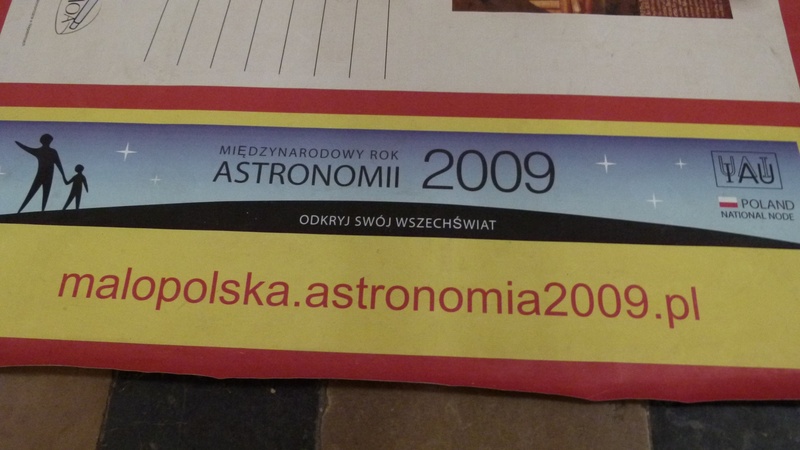 My Kauderwelschführer “Polnisch” (Reise Know How) asks: “Polnisch – unaussprechbar?” (Polish – unpronouncable?). A friend of mine is of Russian origin. 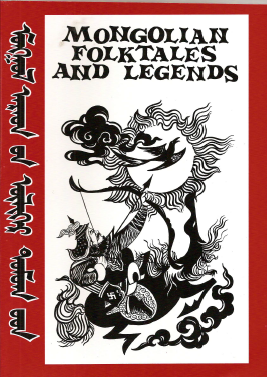 He sighed contending that the Polish language would be much easier to read, if they used cyrillic letters. I agree, cyrillic letters would make the hissing sounds such as “szcz” and the soft consonants such as “ń” easier to read, but what about the nasal sounds (ą or ę) and the “ł” that reminds me of the “uu” in the Swiss Bernese dialect – they do not exist in the cyrillic alphabet. Polish uses breathtaking combinations of the Roman alphabet to express their many hissings, soft consonants and nasals. When I see such congestions of consonants such as szcz or rz, I have to stop and translate them into something known to me (in this case щ and ж). I have to be careful to recognize the consonant combinations that make up a hissing sound. I try not to miss the little nasal tails added to vowels and I always get stuck, when the “ł” (uu) appears between two vowels. I often forget to spell “rz” as ж: warzywa (vegetables), pieprz (pepper), and in Mongolia I came across the Przewalski horses. Congestion of combined letters such as rz, szcz or ści, in particular when combined with the nasal ą or ę: chrząsczc (beetle), rzeczywiście (really), wewnątrz (inside), mężcyzna (man) or część (part). and here is the frightening Polish word for “pull” that sounds soft and perfectly flowing, when Radek pronounces it, while I keep on stumbling over it. What I find most difficult in Russian also holds for Polish. It is the concepts of verbs, with the perfect and imperfect action modes, overlayed by the modes of movement and the slawic variation of the gerund. When I tell my Polish friends that I struggle with the difference between приходила (she came and left again) and пришла (she came and is now waiting here), they do not understand the problem and the difference is clear to them. 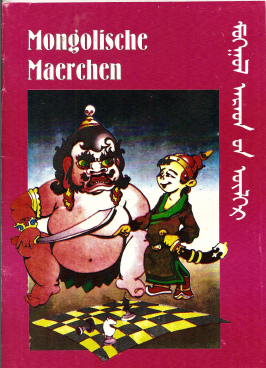 In German, we would say: “Sie war da und ist wieder gegangen” (in English “she was here and left again” – an imperfect action) and “sie ist gekommen und wartet hier” (“she has come and is waiting here” – a perfect action). We simply do not have the notion of using different verbs for an imperfect (or canceled) and a perfect action. What makes it even more difficult is the fact that there is no rule to derive the perfect from the imperfect verb or vice versa – often they are two completely different words. An example for Polish is the verb “see“: widzieć (imperfect) and zobaczyć (perfect). And to complicate things even more, the basic forms of the verbs of movement describe an imperfect action, but differentiate it by the direction (“one direction”: идти versus “back and forth or around”: ходить – and then there are many more details to remember to use the verbs of motion correctly and not be misunderstood). Another difficulty of slawic languages is that the numbers are declined which can become complicated for composed numbers. Yes, Polish is not easy to learn for us Western Europeans, but for my ear it is one of the most sonorous languages that I know. No, I do not feel like visiting Podgórze. 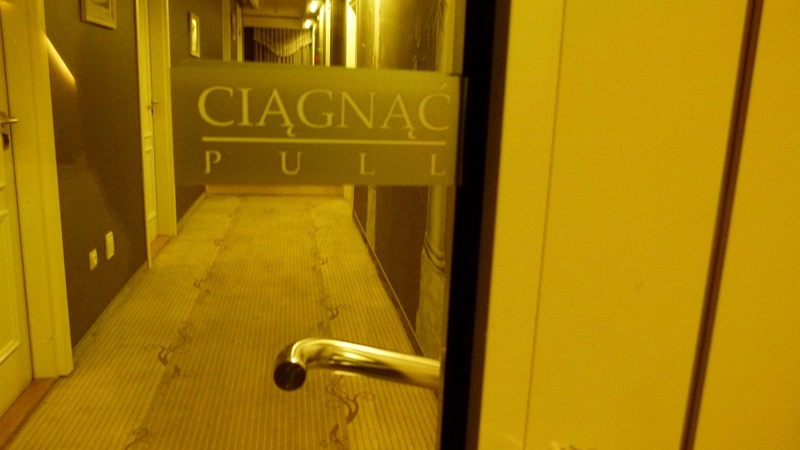 Because this is the place where too much happened seventy years ago. 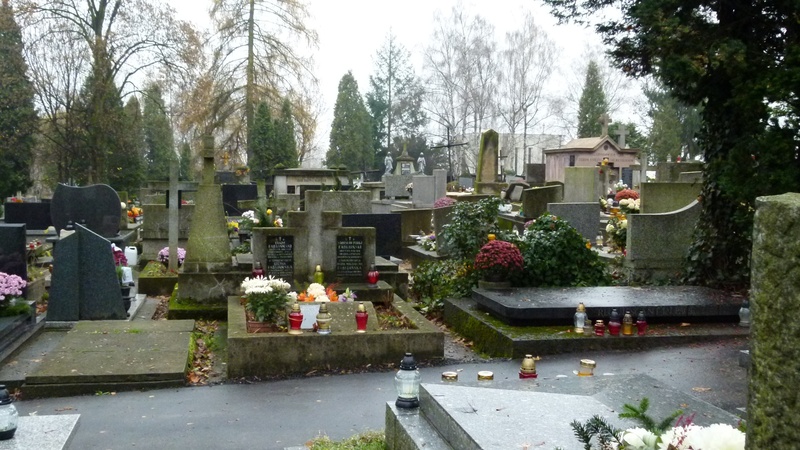 I know that in Podgórze, Schindler composed his famous list and saved the lives of some lucky. I know that the concentration camp was here that became the scene of Spielberg’s film “Schindler’s list”. I saw that film some years ago, and then could not sleep for several nights. 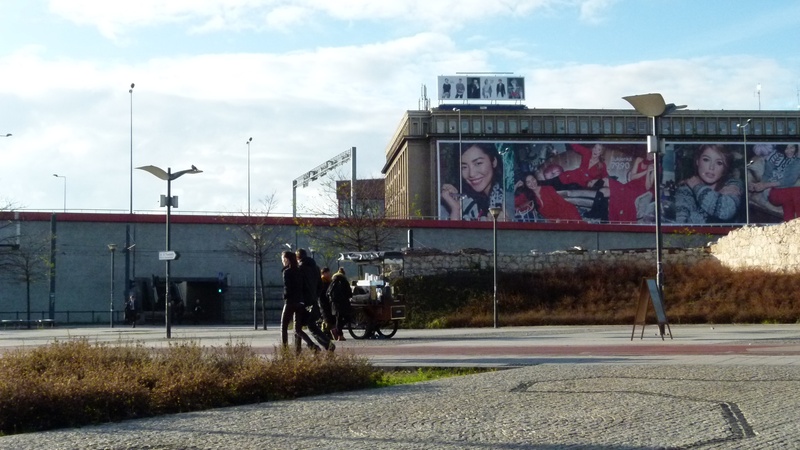 I had also visited the Schindler factory with the team a year ago, which made me also suffer. No, I do not feel like visiting Podgórze. But then, Piotr tells me that this area of the town is his favorite. 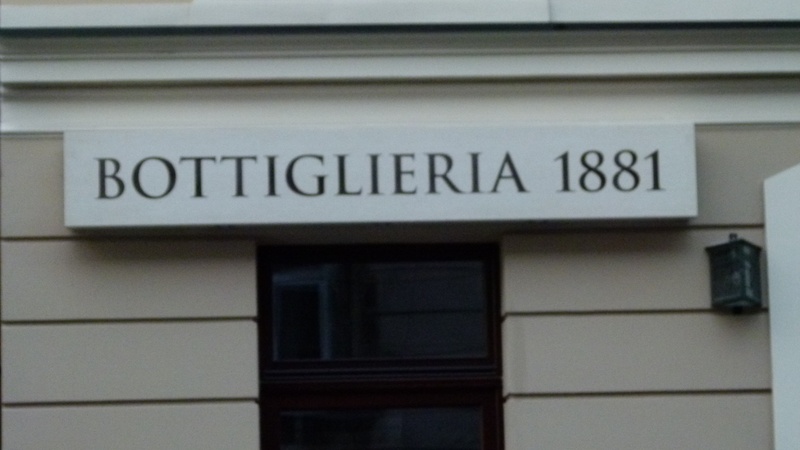 On Sunday, Radek and Agata take me to Podgórze, after an excellent meal and wine in Kazimierz, in the Bottiglieria 1881. 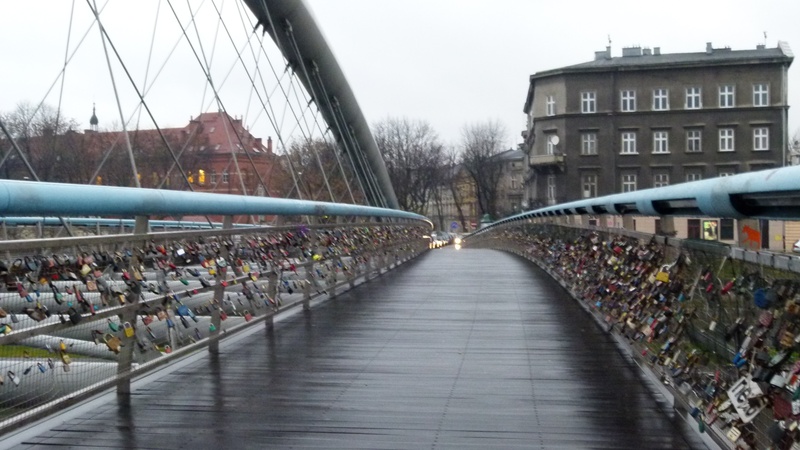 After the meal, we cross the Wisla to Podgórze using the footbridge full of locks symbolizing the marriages of hundreds of Krakówians – if only my lock would hang here as well… and I wish that you will mount your locks at some point in time. 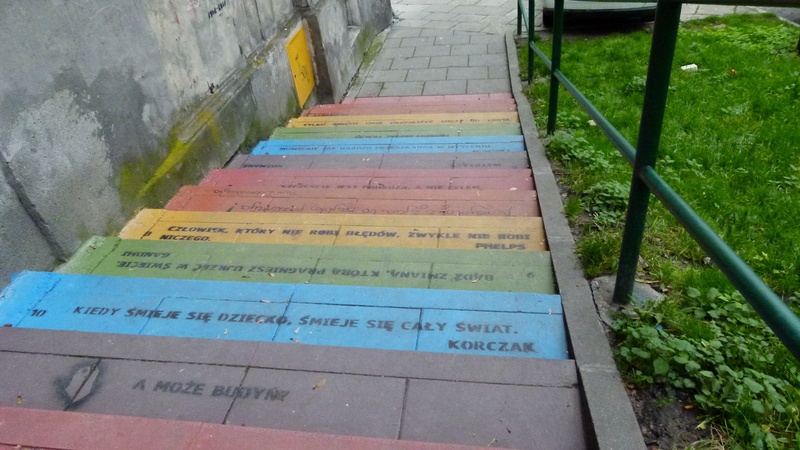 Next we step up the stairs with all the philosophical thoughts – written in Polish. Agata and Radek translate for me… I like the thoughts and forget the statements again. 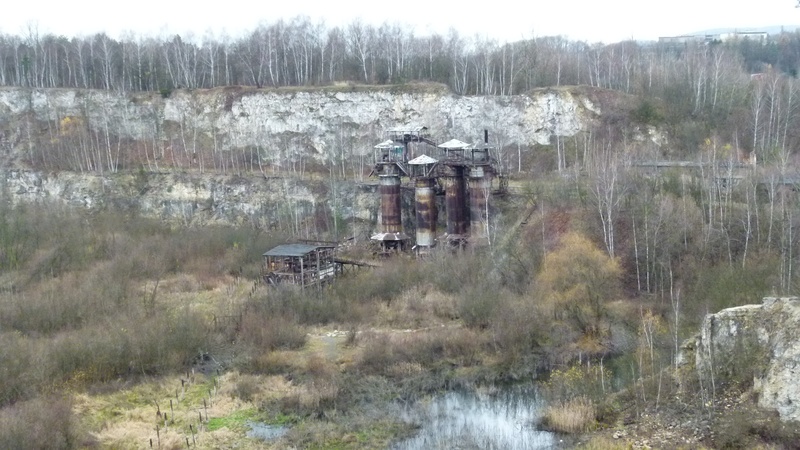 My guide book proposes a walk through Podgórze to the tomb of Krak and to the stone quarry with the site of Plaszów (my guidebook: Krakau, Michael Müller Verlag, 2011). 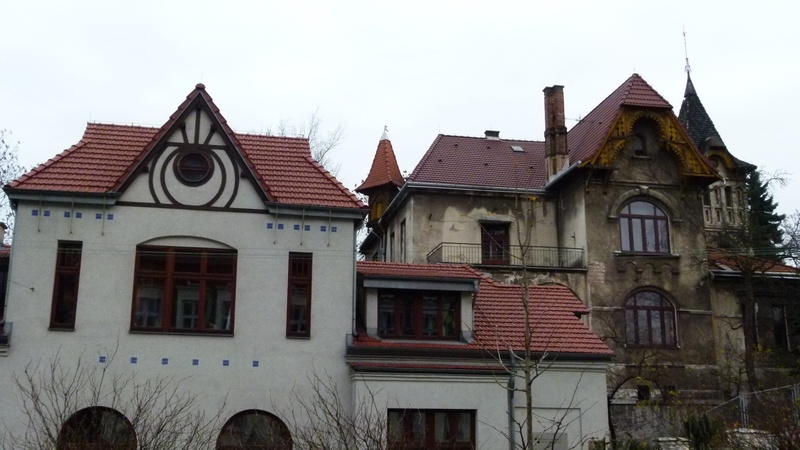 From the Rynek I walk uphill taking a foto of two elegant houses (though one of them would need some renovation – the Willa Mira with its wooden decoration). Next, I find the Benedykt church and another fort built by the Austrians, when Galicia belonged to them (I had also come across an Austrian fort in Zwierzyniec). And in front of me is my next target, the tomb of Krak (Kopiec Krakusa). 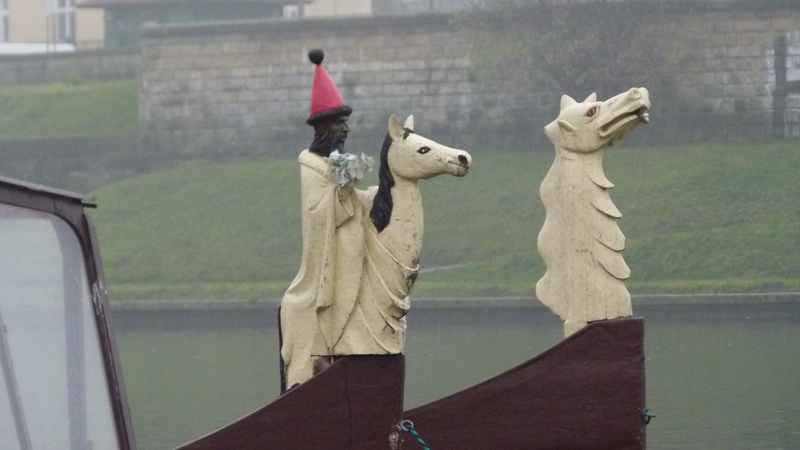 Krak was the first king of Poland. He also made Kraków his capital. A street with heavy traffic separates me from the tomb. 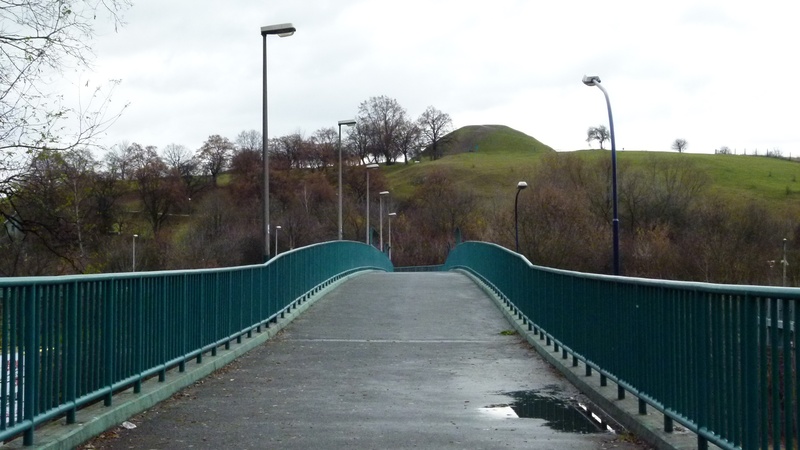 I oscillate a bit to find this footbridge. 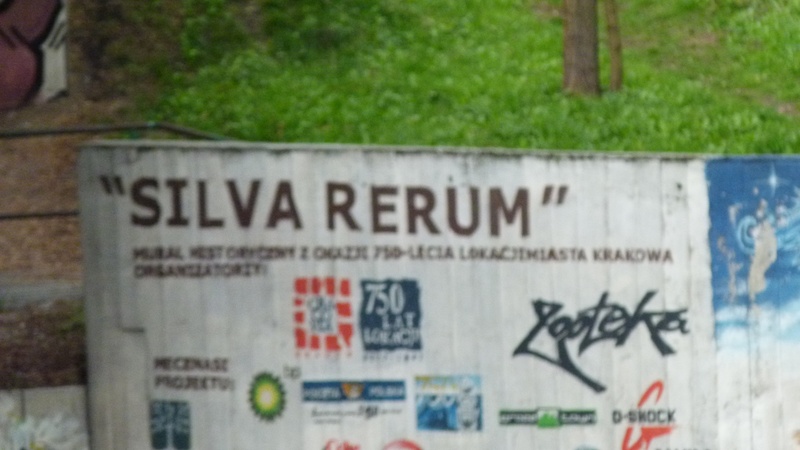 And now I understand, what “silva rerum” stands for… it is a wall with graffiti describing the history of Kraków from Krak and his smok to pope Johannes-Paul II. It can be seen from the footbridge. 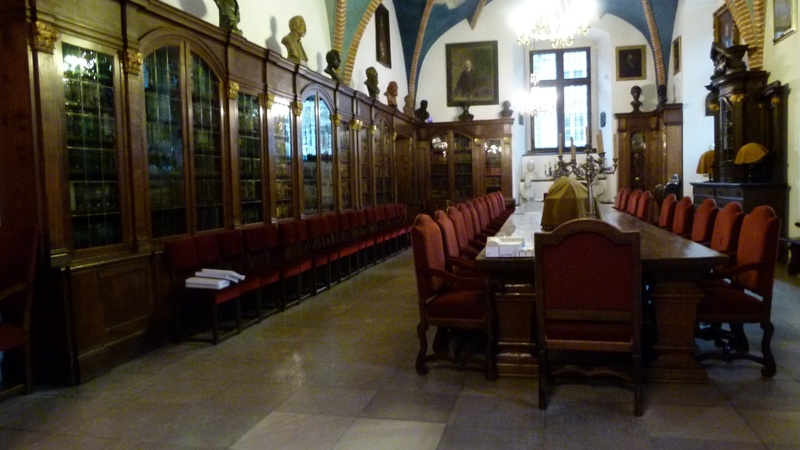 And yes, the pope belongs to the history of Kraków. He was a courageous priest here, before going to Rome. The path is wet and dirty leading up to the tomb of Krak. 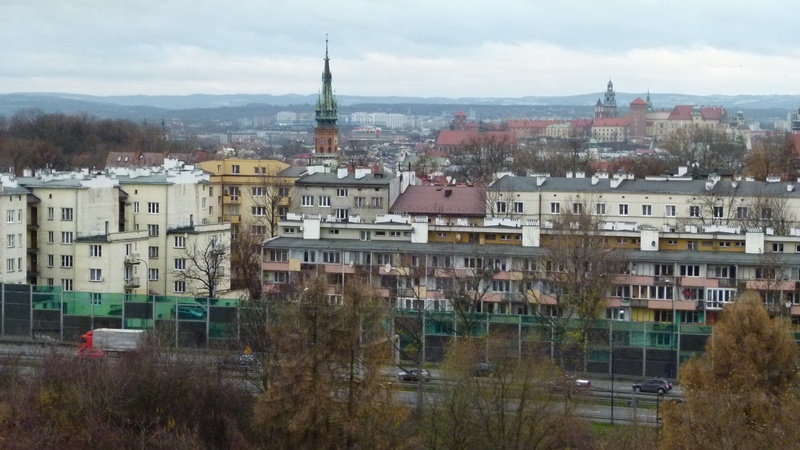 Here I have a view of the city center of Kraków. Through the mud I continue my way to the cemetary and the stone quarry Liban with the strange engine that also appears in the film. 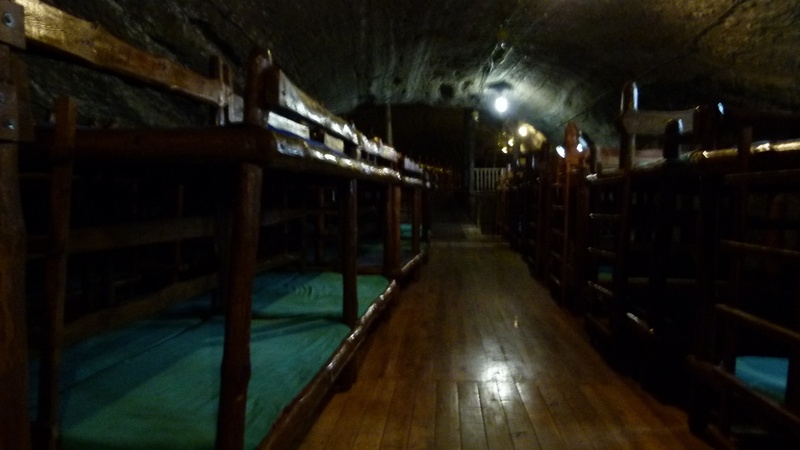 I enter the space of the former concentration camp…. and almost get lost in an open space. There is not much left of the camp, but being here made me sense that the prisoners could turn up behind the trees and bushes. 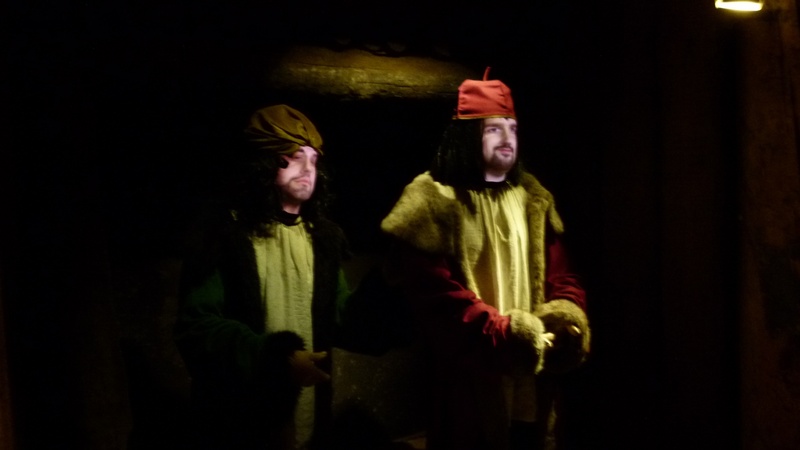 I return back to Krak’s tomb and then to the Rynek of Podgórze. 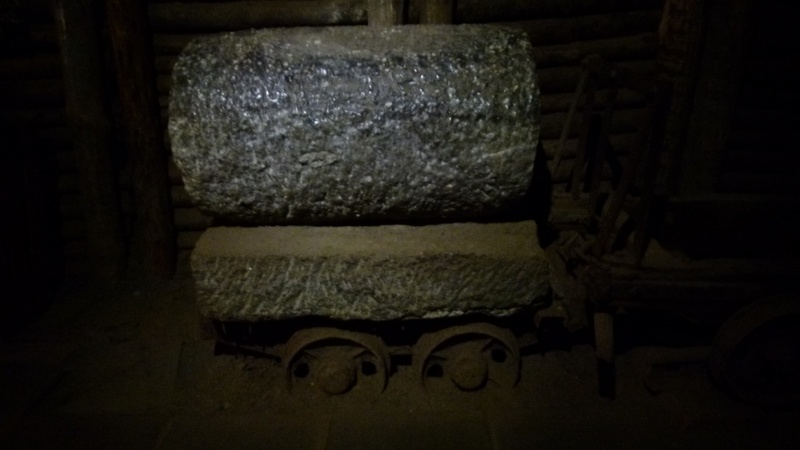 Now I know, why Podgórze is called “Pod-Górze”. 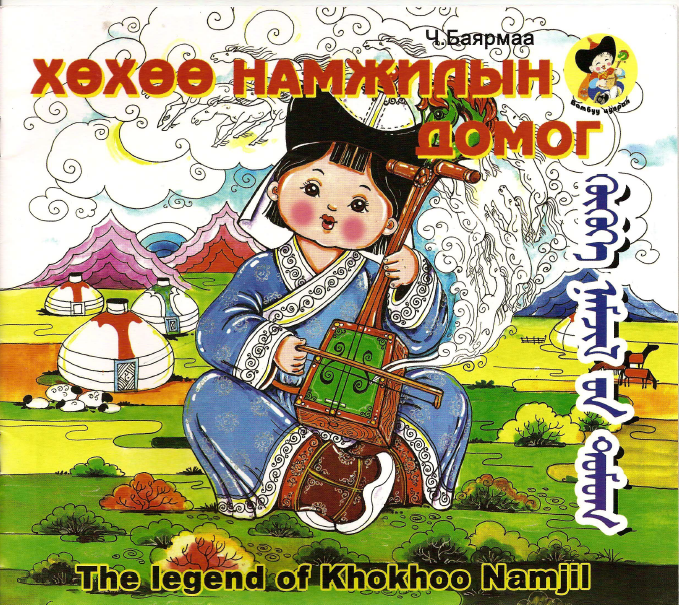 It lies at the foot of a hill and grows along its slopes. 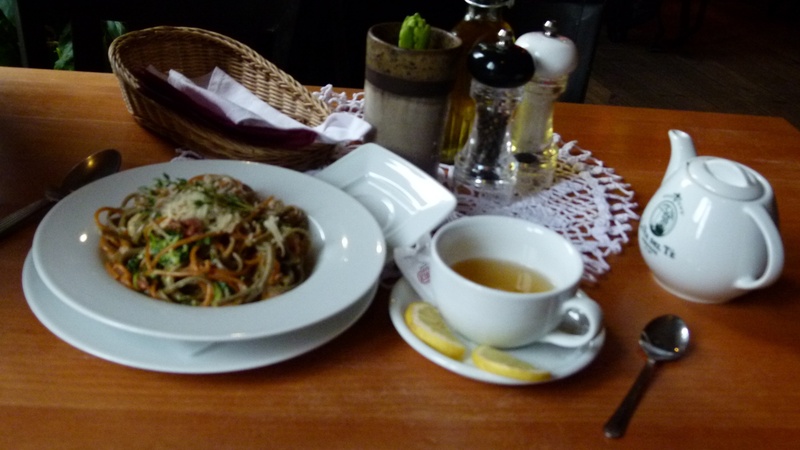 In the sweet little restaurant Makaroniarna, I have some delicious spaghetti and a fresh mint tea to warm me up. On Plac Bohaterow, I find the pharmacy “Pod Orlem”. Today it is not as welcoming as it was for the Jews of the ghetto seventy years ago. 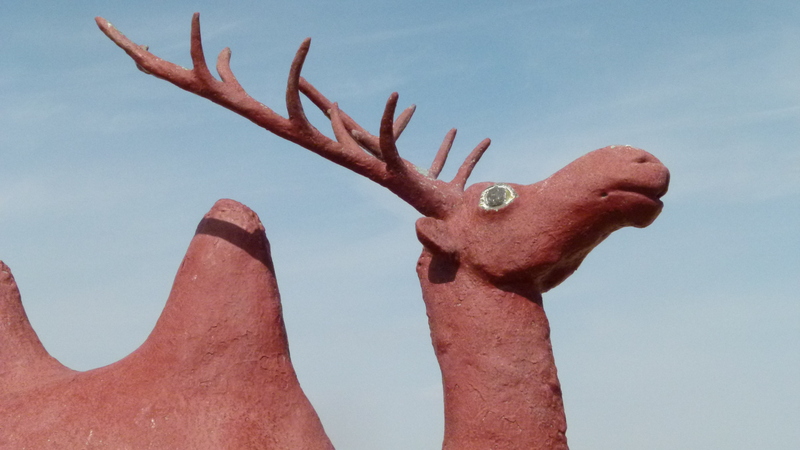 To visit the museum, reservation has to be made three days ahead (even, when already here). 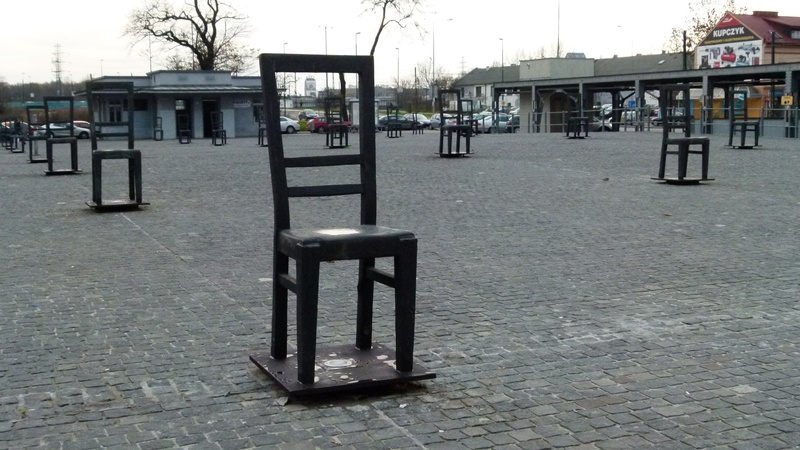 I like the monument of the chairs spread over the open square and also along the tram station, inviting people to sit down, while waiting. 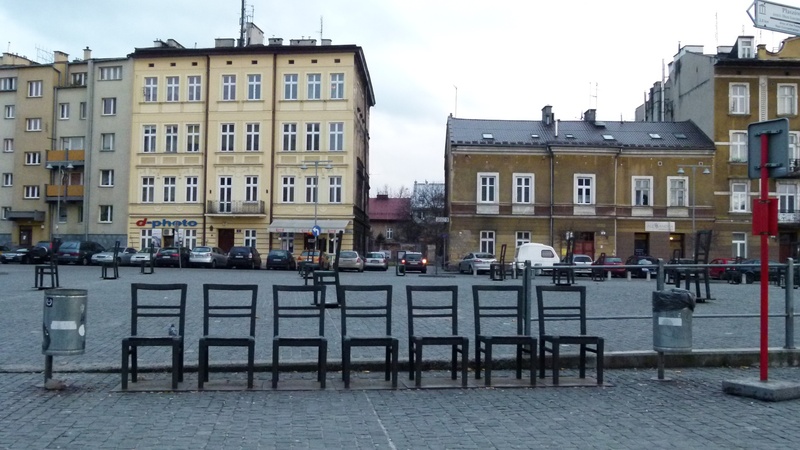 The main entrance to the ghetto was here… and these chairs now invite to sit down, reflect and link up with the past and with this charming area of Kraków. 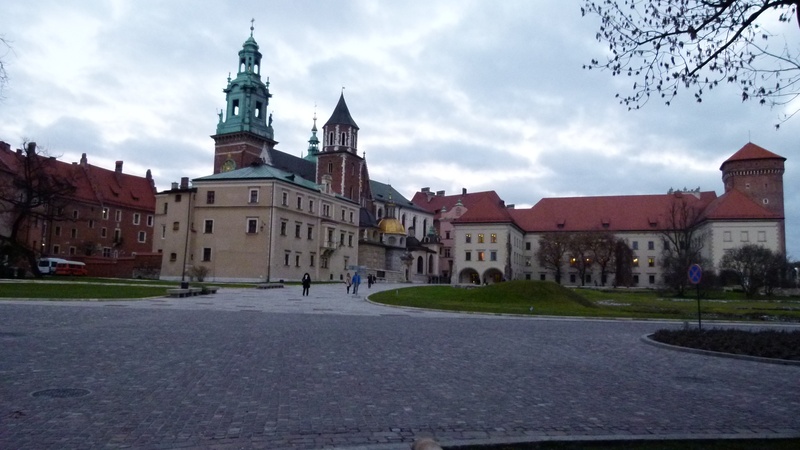 It needs a lot of phantasy to imagine what the Wawel looked like before it has been destroyed. I keep great memories of having visited the cathedral with Bibi a year ago. 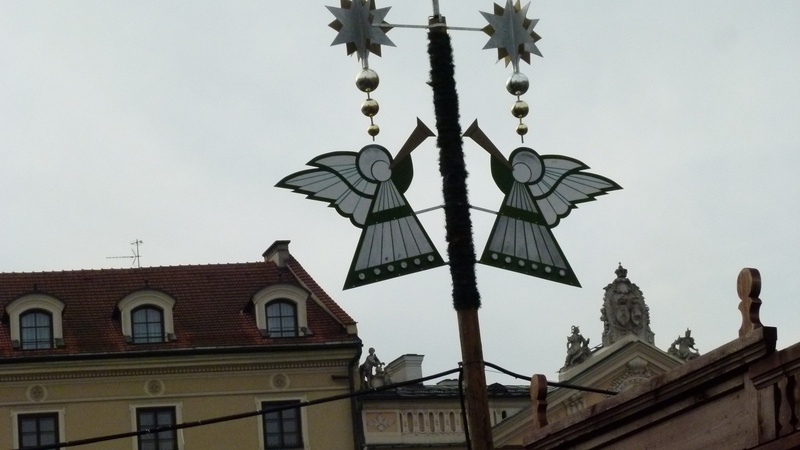 Now I walk to the Main Rynek to say good-bye and get ready to flying home. It was a great time in Kraków. I am very happy to have met friends… a great thank you for everything. 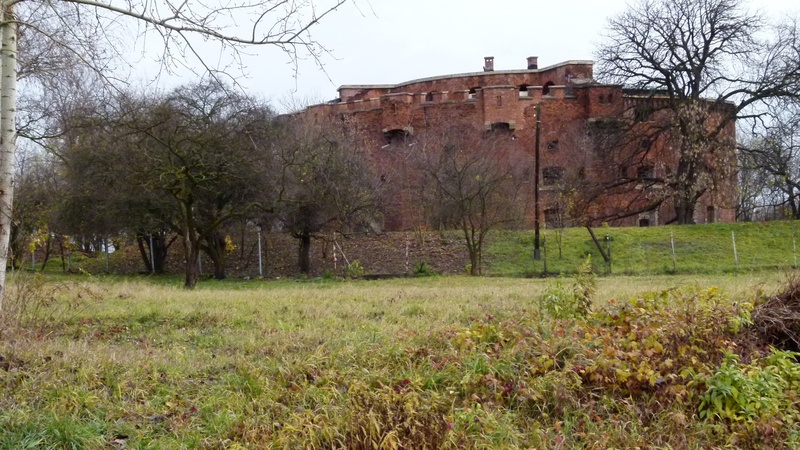 Today I find my way to Zwiercyniec by staying north of the Wawel and then walking along the Wisla. 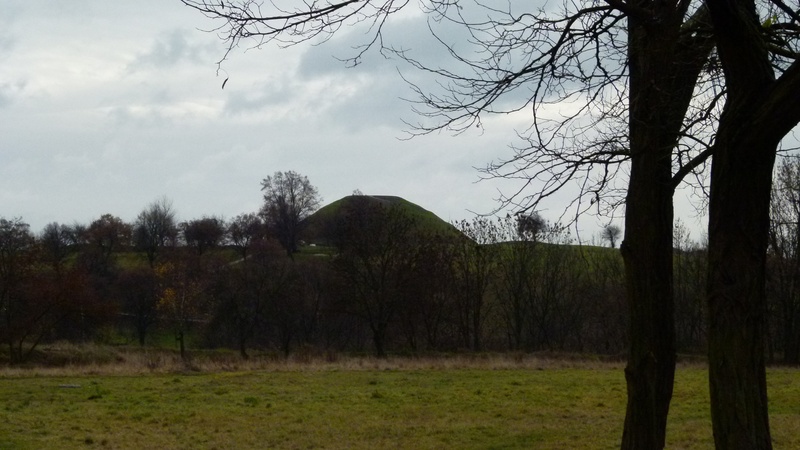 My targets are the small hill built for Tadeusz Kosciuszko and some churches on the way. Mongolia keeps on greeting me here in Krakow. 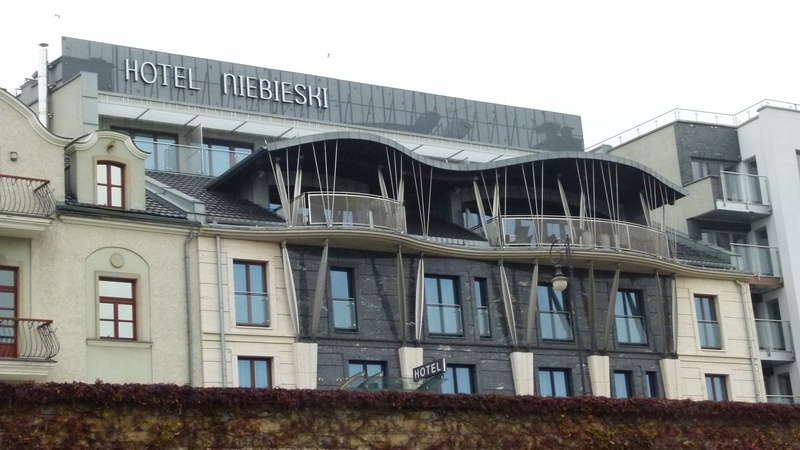 The hotel Nibeleski has a great view of the Wisla and the Wawel. 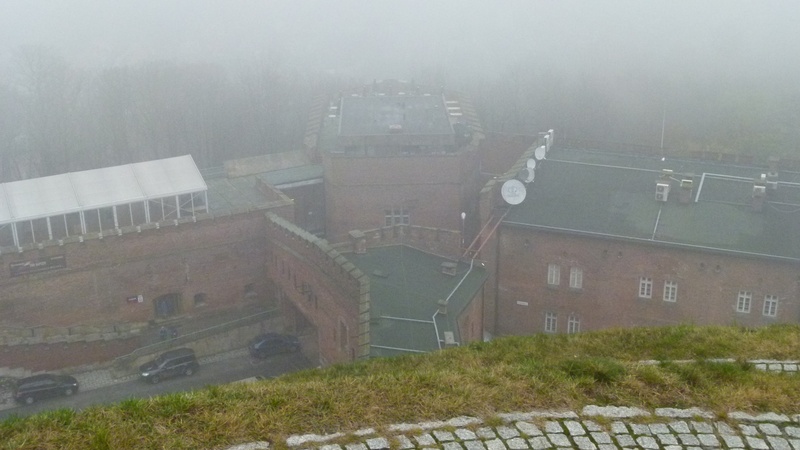 Well, today the Wawel looks mysterious in the fog. After the first steps uphill I look back at the monastery of Norbertanek. 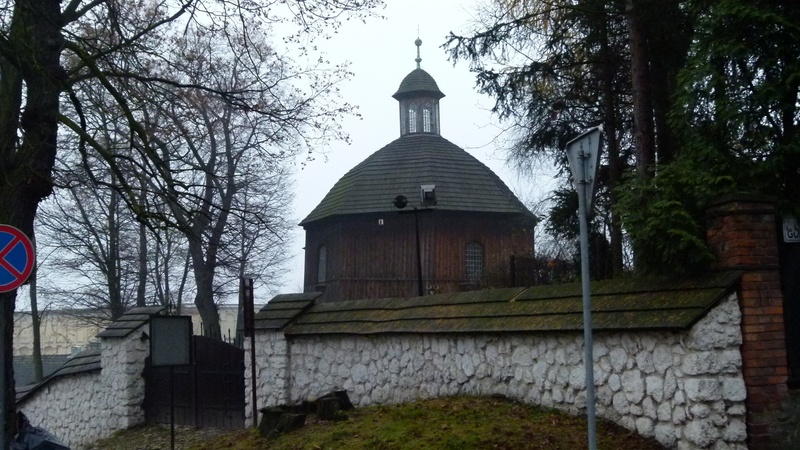 To the left is the charming small wooden chapel built for Malgorzata. My guidebook tells me that it has been rebuilt several times, because it had burnt down repeatedly. 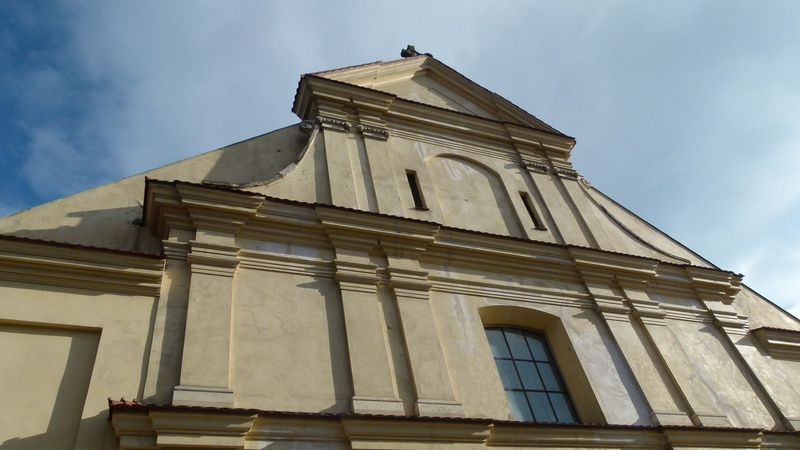 It originates from the 16th century and was built for those who died during the plague. To the right is the church of the Savior or Salwator behind a locked gate. 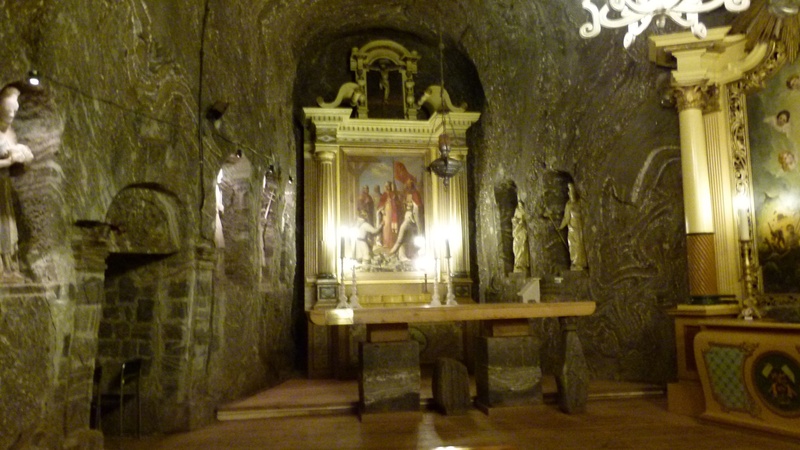 Legend says that here was the first Christian church of Poland. The hill, the cemetary and the tram end station are called Salwator as well. Flowers are announcing the cemetary. 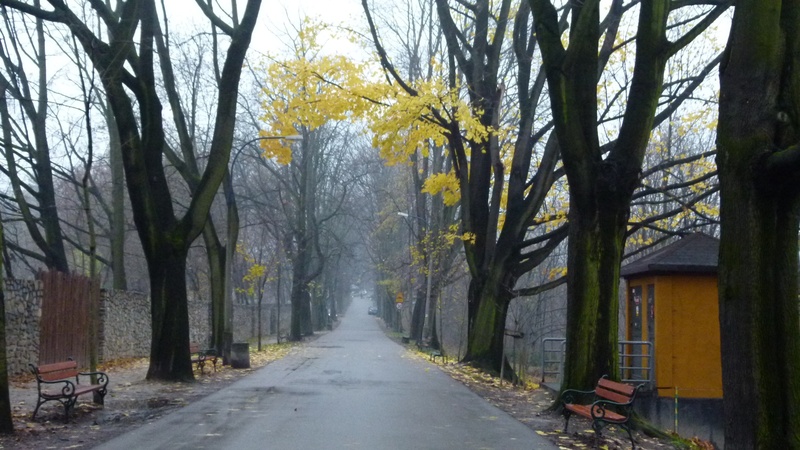 It is late November on the alley leading to the fort of the Austrians and the Kopiec Kosciuszki. 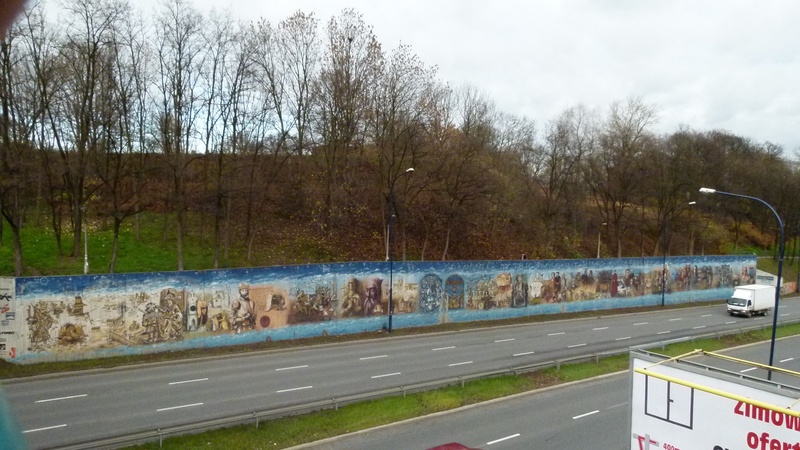 To climb the hill of Tadeusz Kosciuszko I have to pay eleven Zloty. 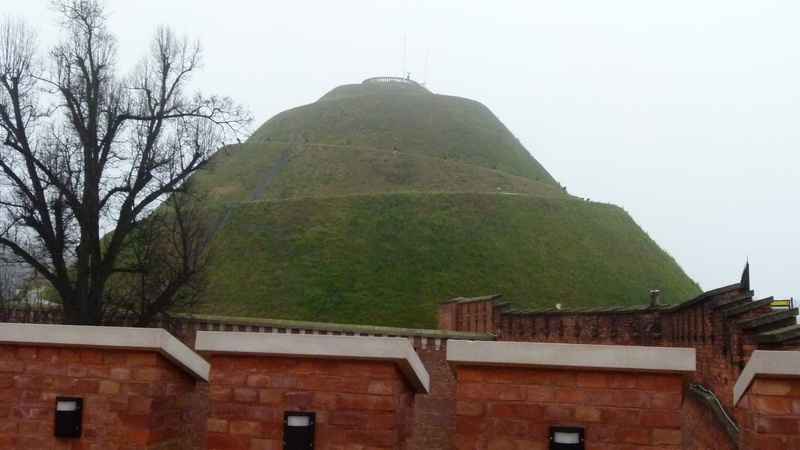 The paved path leads almost flat around the hill – I feel dizzy, when I arrive on top. 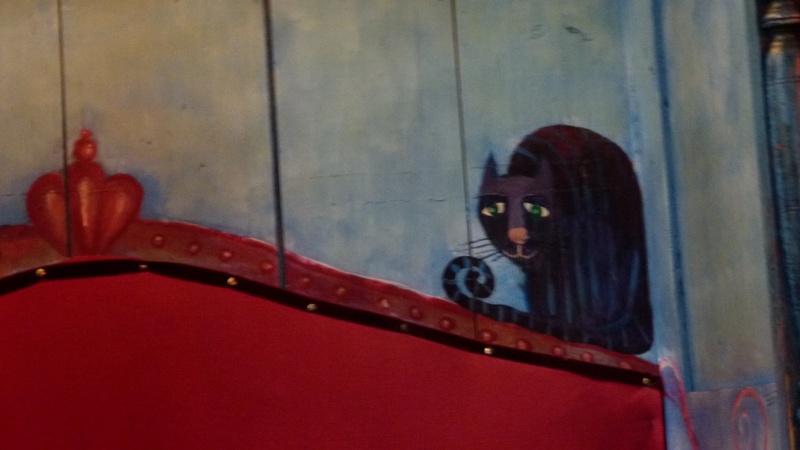 A panel reminds of Tadeusz. Around 1800 he courageously tried to free Poland that had been erased from the maps. 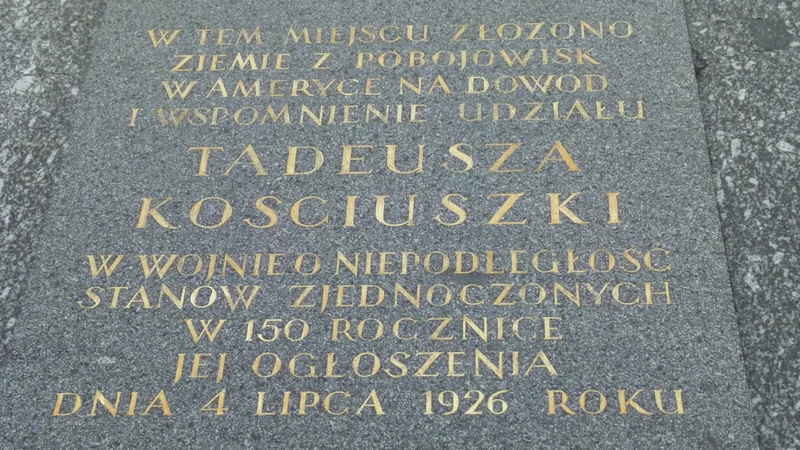 I admire how much Poland fought for freedom, achieved it in 1919 and was the source of the dramatic changes in 1990. 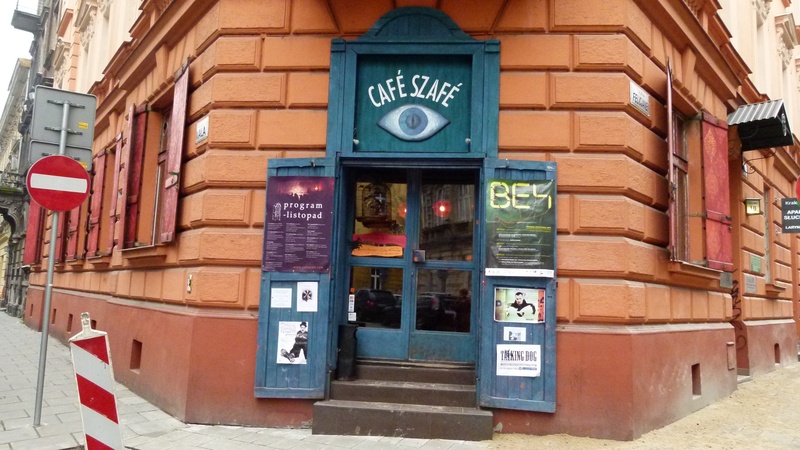 Back in Piasek I oscillate to find the cosy coffee place Szafe. 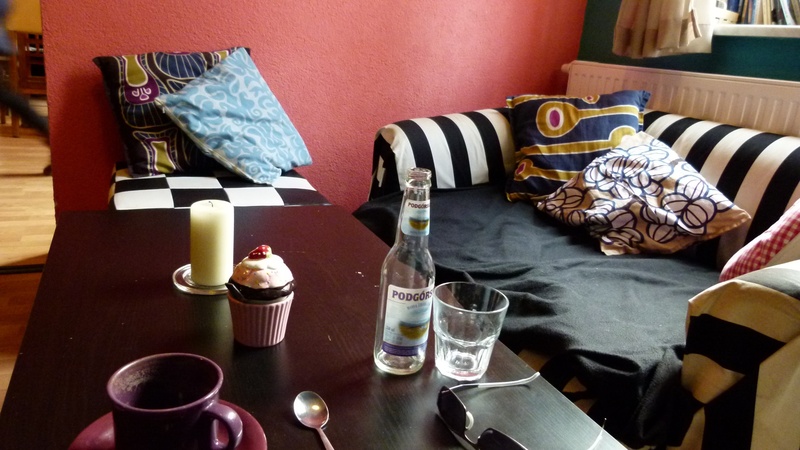 I share a coffee and a piece of cake with the goat and the black cat above the red sofa. the rooms where the professors lived (but, says the lady, they were monks and lived in much simpler conditions. In addition, the rooms had open windows and where damp and moldy). The auditorium is the place where doctors and professors are honoured. 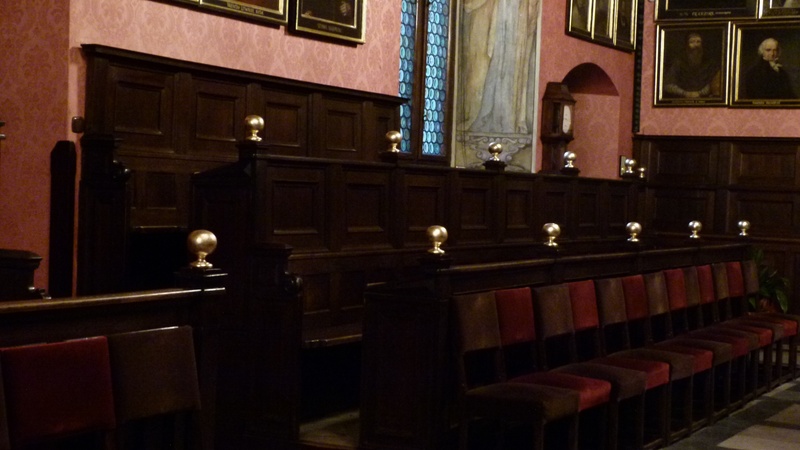 On the walls there are portraits of the professors in several centuries and of the only lady allowed in the collegium until the end of the 19th century, queen Jadwiga, the wife of king Yagiello. The university is proud that Kopernikus was here. They show the list of students with his name on it (and, yes, he has paid the fees). 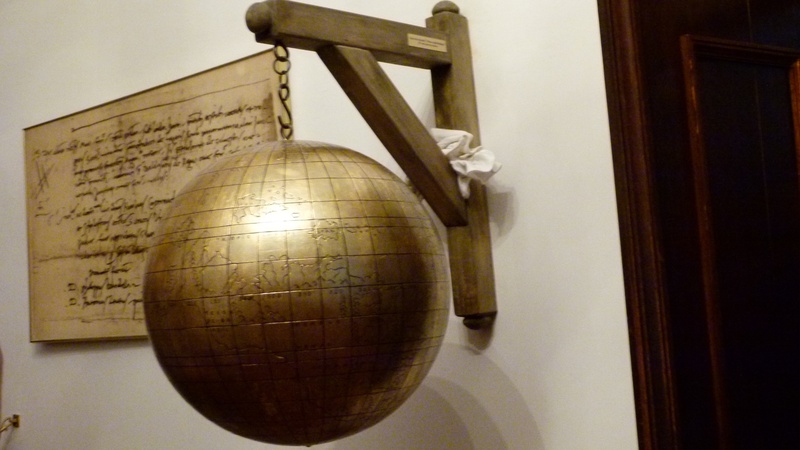 Also on display are his tools and the globe from 1521, which already shows America on it. I round off the day with a borschtsch and salmon in the Smak Ukrainski and with a concert in the St. Peter and Paul’s Church. 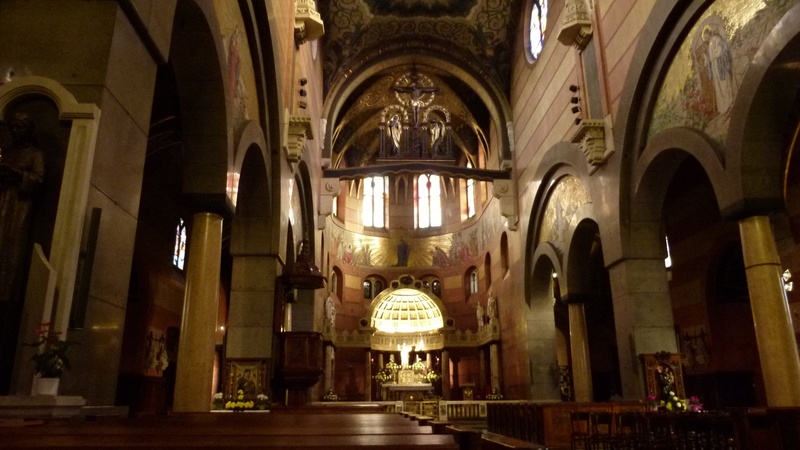 This is my second concert… I was already in the St. Adalbert Church. 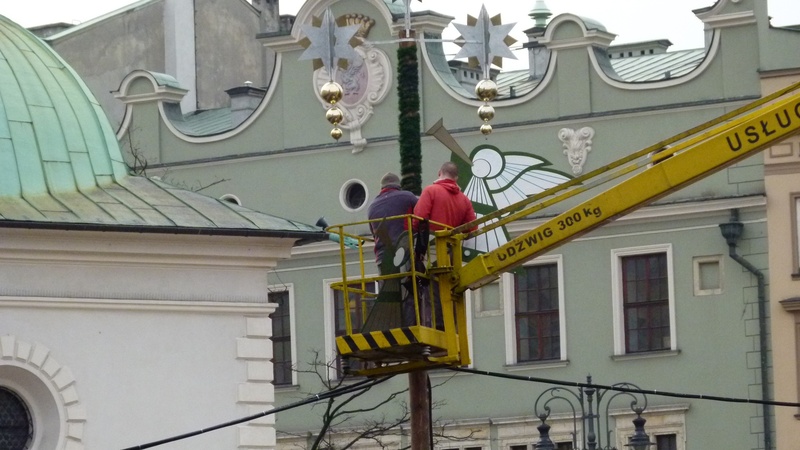 I just wonder, how Kraków will warm up their churches, when the temperature will be far below zero. The concerts are well worth listening to, but after an hour I need a hot drink, even with November temperatures. 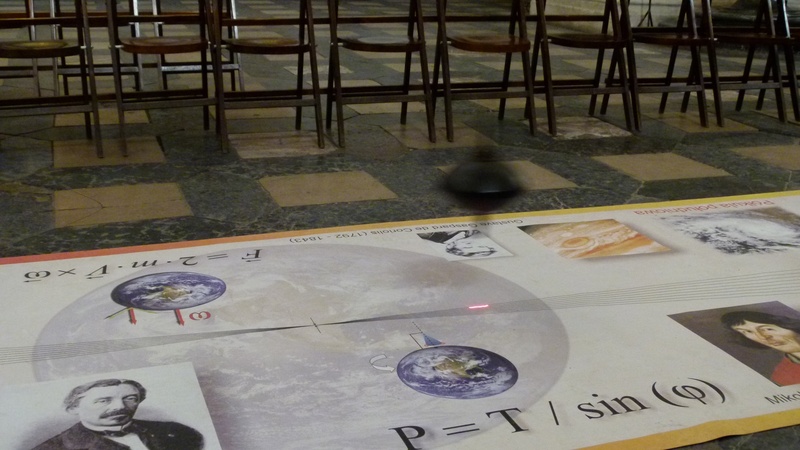 In St. Peter and Paul’s church there is an installation that demonstrates, how the globe is rotating. 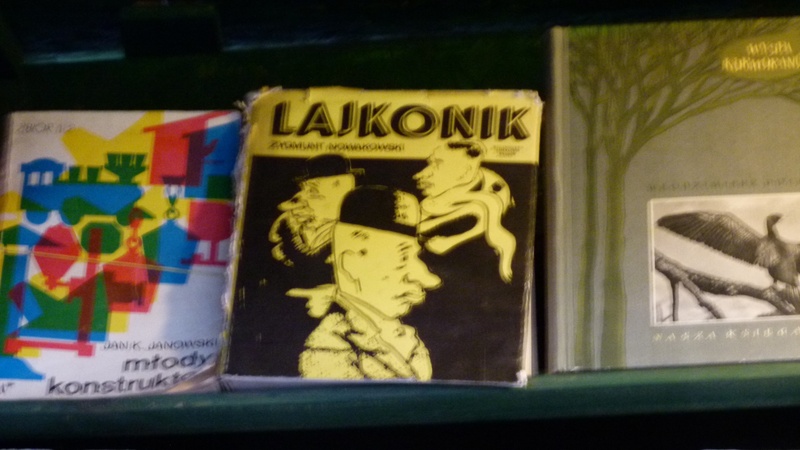 Kraków is proud of Kopernikus, Foucault and Coriolis. 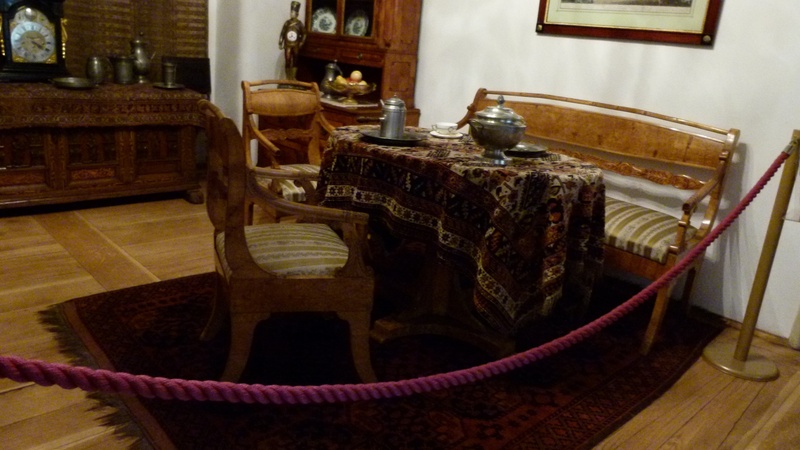 Every Thursday, a pendulum is installed above a carpet. The man presenting it shows humor. He hangs the pendulum on to a string, keeps it attached with a rope and asks one of the spectators to burn the rope with a lighter- the pendulum starts to swing along the carpet. 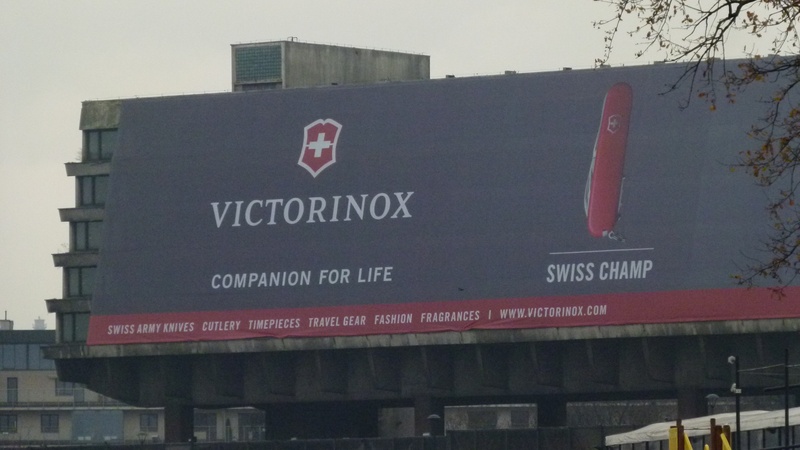 and of a Swiss advertisement that made me feel at home. And then, I am confused. 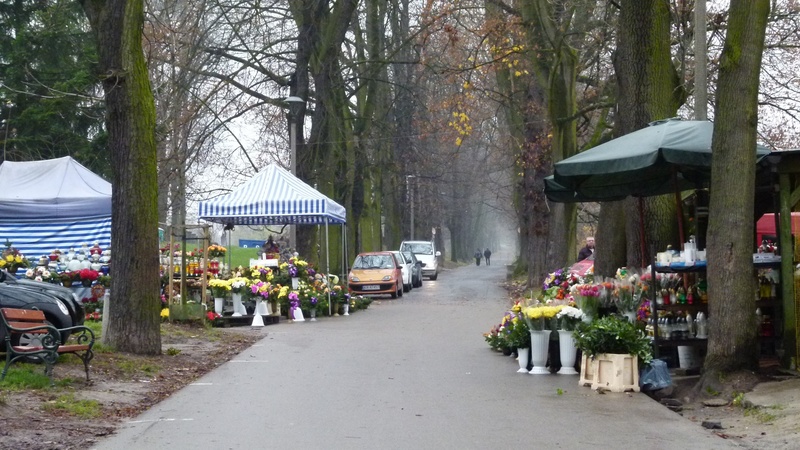 I do not recognize the streets here as being part of Zwieryniec. Dlugosza Uliza? Where am I? I have to take a rest and think about this. The small bar Swinka looks inviting. It is lunch time. I take a seat on the cosy sofa and eat placki with a light mushroom sauce. I am happy to have found placki without the heavy Gulasz, just a plain meal like the Kartoffelpuffer that my mum (originating from Berlin) prepared. As I have calmed down my stomach I have another look at the map and now all becomes clear to me. 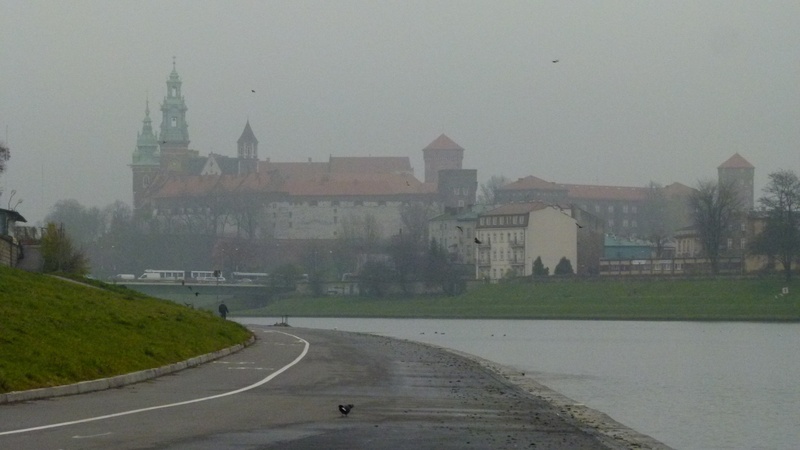 The Wisla forms a right angle under the Wawel Castle, and crossing the Grunwald bridge coming from the Wawel Castle, I have only crossed the river once, but should have done so twice to reach Zwieryniec. Actually I have ended up in Podgórze instead. 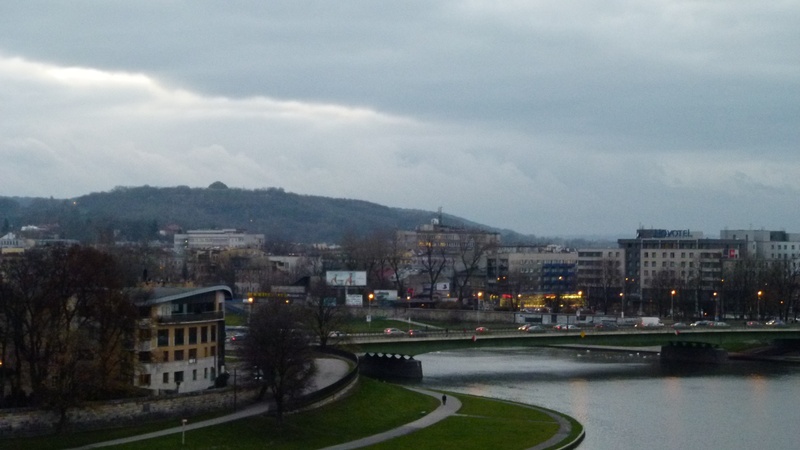 Also the Wisla is “turning”. 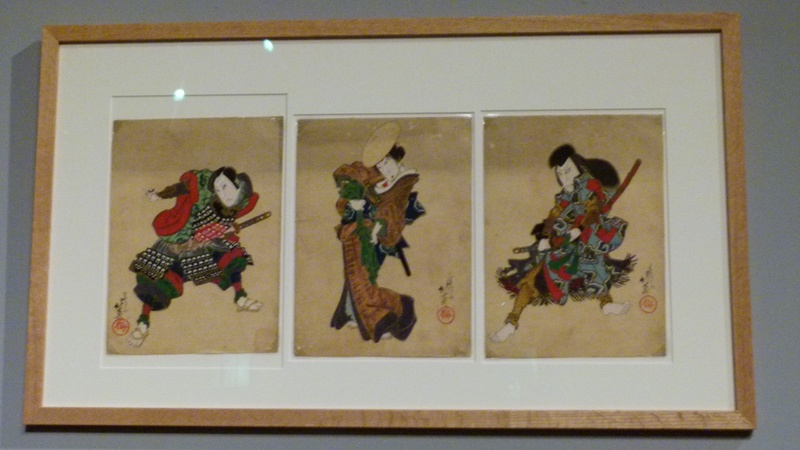 I decide to walk back and visit the Japanese Mangha Museum. In an astounding architectural setting it shows woodcarvings that illustrate and advertise Japanese theater from the 18th and 19th century. Harmony in the pictures. The plays must be tragedies, because the men always look angry, while the faces of the ladies (also played by men) look mostly gentle. Max Ernst is a surrealist. 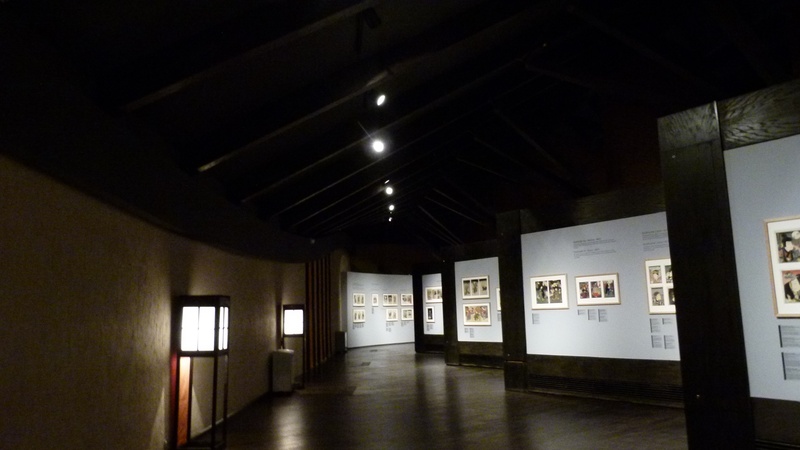 There is a temporary exhibition of drawings and book illustrations he made. His drawings are fun, but what astounds me most is the ballad of the soldiers that he illustrated: “Soldaten… verteidigt unsere grosse Kultur, die nur wir allein besitzen. Soldaten.” This sounds frightening to me: “Soldiers… defend our great culture that only we and only we own.” I am not sure, whether this is meant seriously, but this is an utterly dangerous statement. 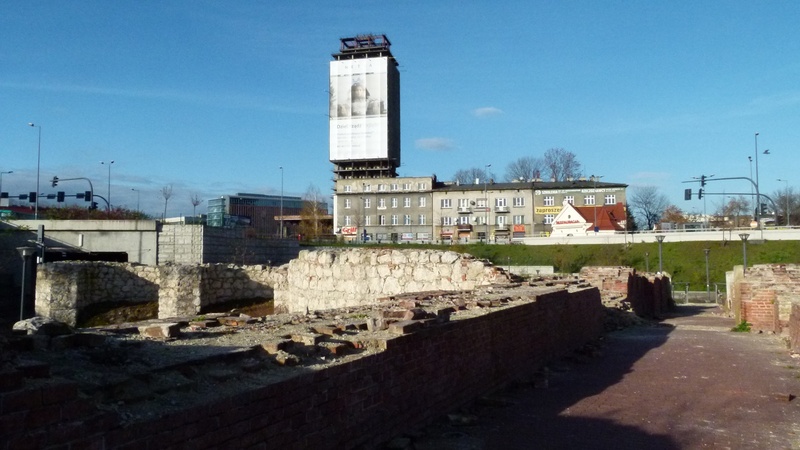 Kazimierz would look different today, if such thoughts had never existed. 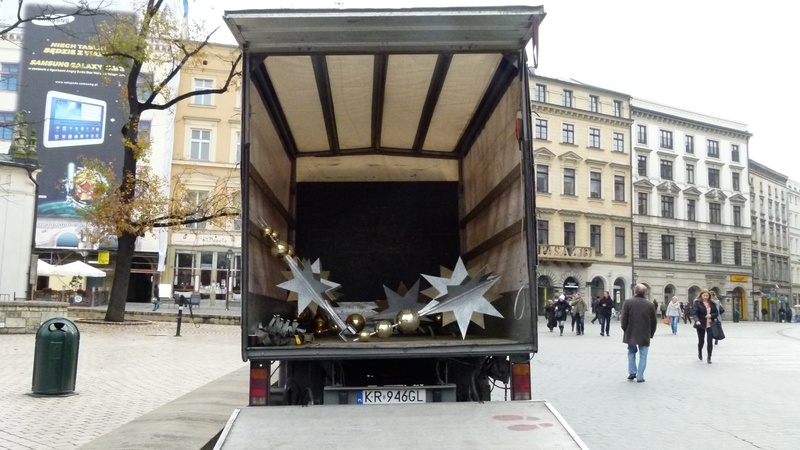 There is activity on the Rynek: The Christmas market will soon open. 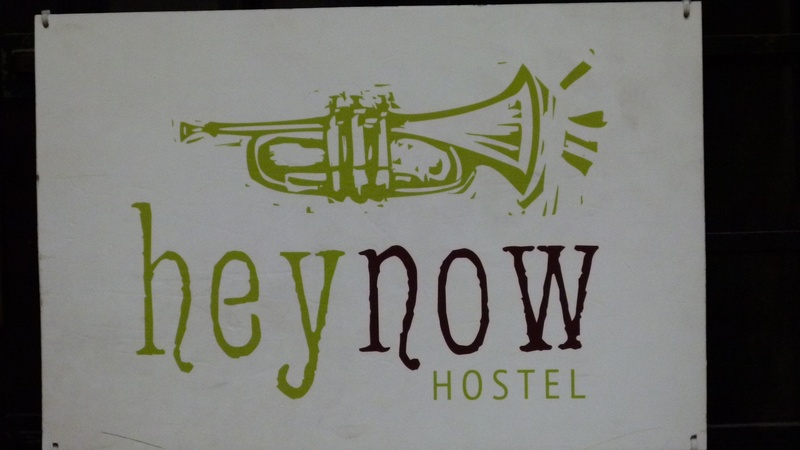 and I find another trumpeter or hejnal inviting guests to a hostel in Florianska. 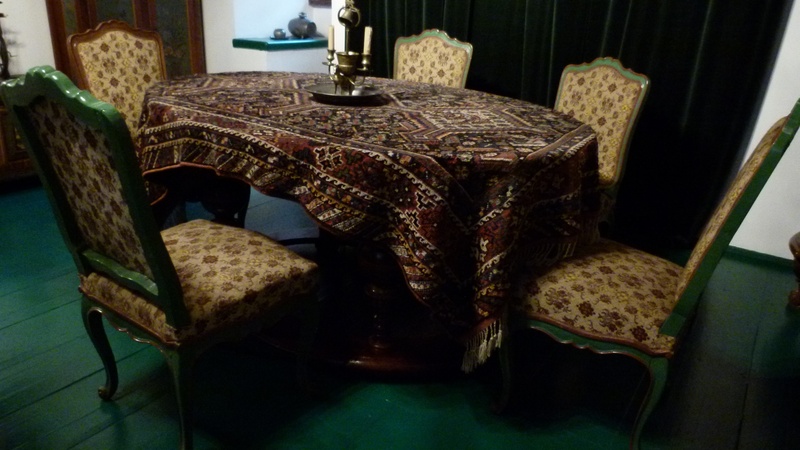 To top off the day, I visit the hipolit house which shows, how a bourgeois family lived from the 17th to the 19th century, mixing furniture of various styles and being afraid of any empty space or horror vacui. 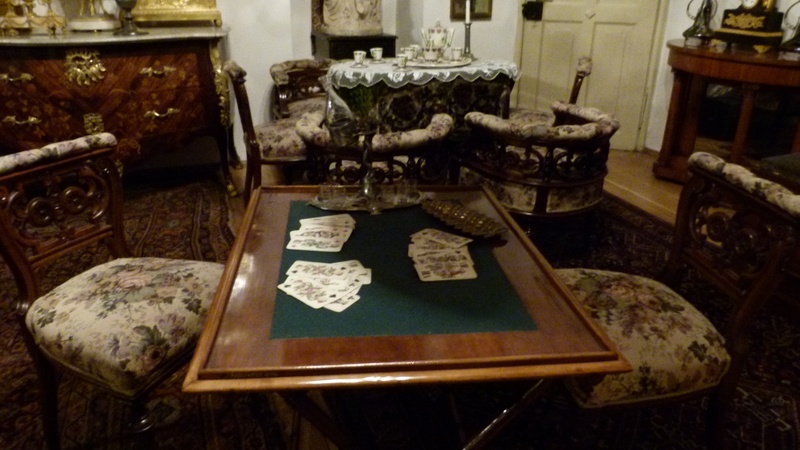 The bourgeois saloons and sleeping rooms were not without charm. 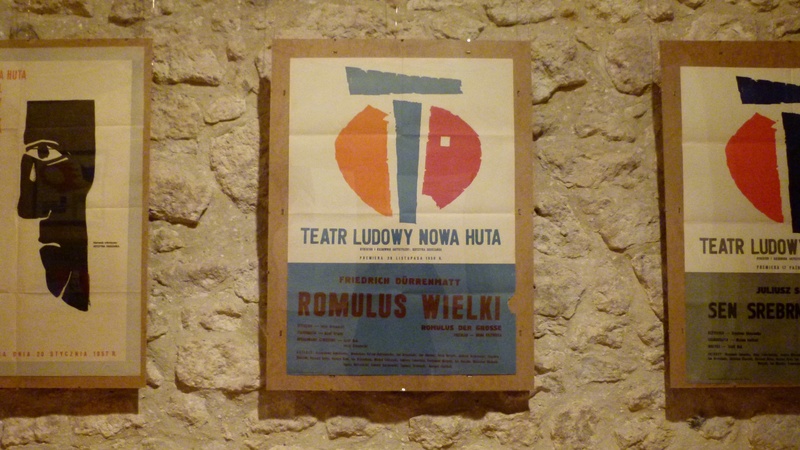 The hipolit cellar shows fotos of theater plays, and I am surprised to find Dürrenmatt, a Swiss author, here. Drinking a cidre in the hipolit bar, I sum up my day. Well, it was not evolving according to my plan, but the unexpected kept great surprises. The last surprise of today was an Aztecan soup in the Mexican restaurant. It tasted like ten years ago in Mexico, when I had shared it with Ernst. Joanna had created that surprise for me – thank you. I easily find the station, where the mini buses leave for all sorts of destinations around Kraków. But without speaking Polish, I am not able to find the bus that is supposed to take me to Ojców at 10:40. Every driver that I ask sends me to a different place. One driver directs me to the huge bus station behind the train station. Here I cannot find an information desk or an overview panel of the many buses ready to take off. After an hour I give up and turn to plan B.
Wesola lies behind the main train station – eastwards. I follow the street Kopernica – named after the man who claimed that the earth is not the center of the universe. 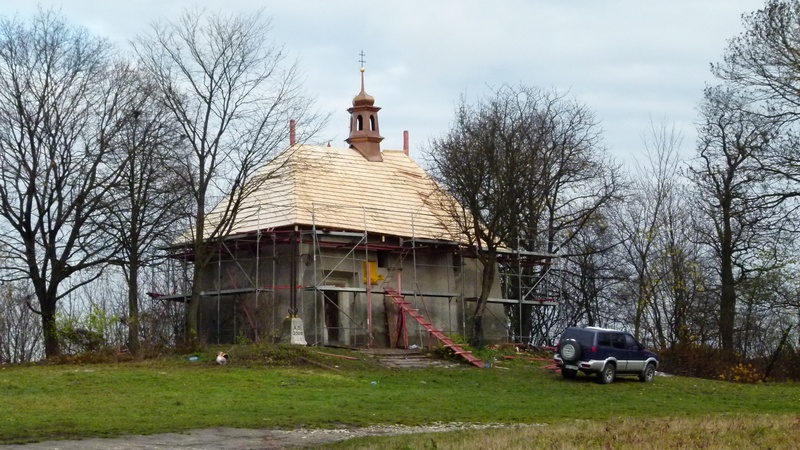 The street is ugly, cars drive by, and the first church promised by my guide book is closed for renovation. It is the St. Niklaus Church from the 12th century. 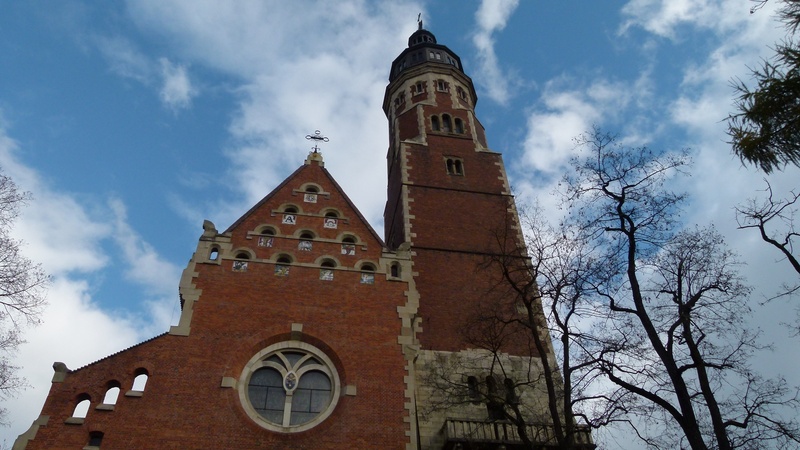 Between 1909 and 1912 Francisek Macynski built the basilika for the Jesuits. I like the brick construction from the outside. Inside, I dive into the atmosphere created by the colorful and modern windows. The room is dominated by the apsis with the hanging figures of Maria and Josef (?) with Christ above them. 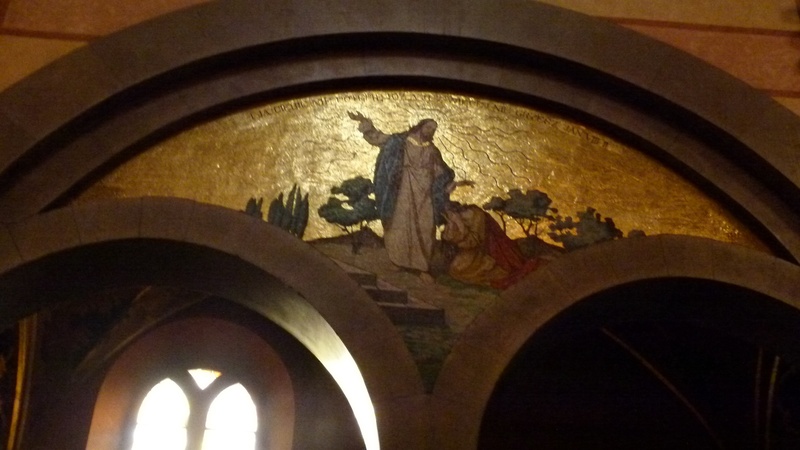 There are also golden mosaics along the walls that give this church almost a byzantine feeling. 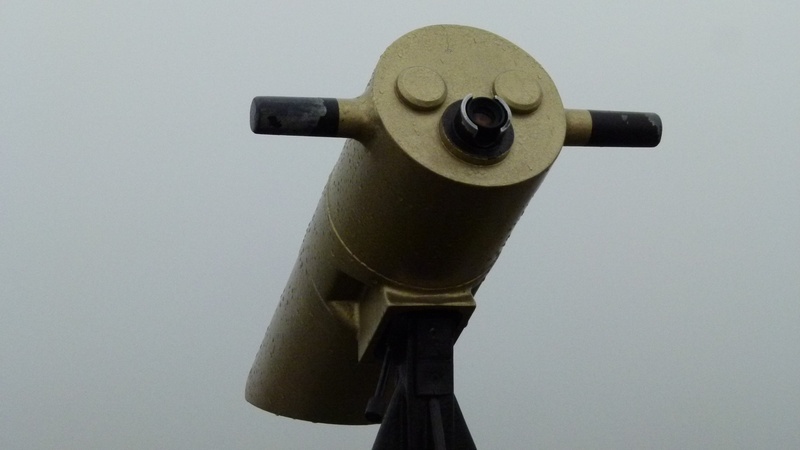 A nun addresses me as “pani” and says something about light. Then she unlocks a gate and asks me to enter. I find myself in a beautiful modern chapel. 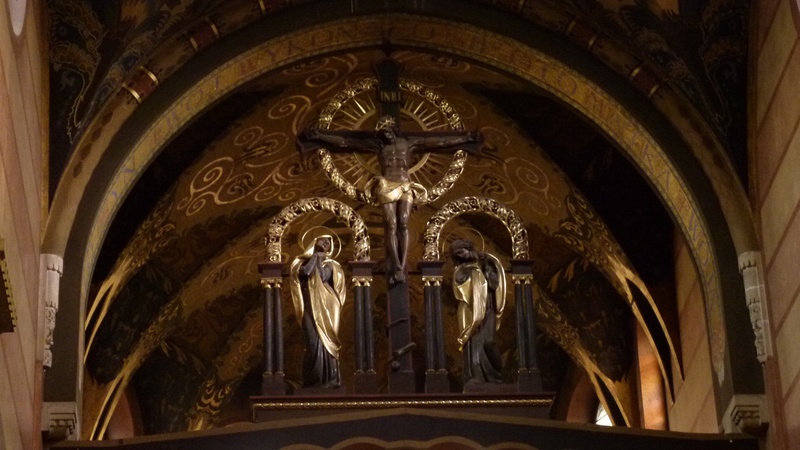 The altar is an irregular metal oval with the sun in the middle. People are praying and adding candles on the shelf in front of the altar. I also add a candle. 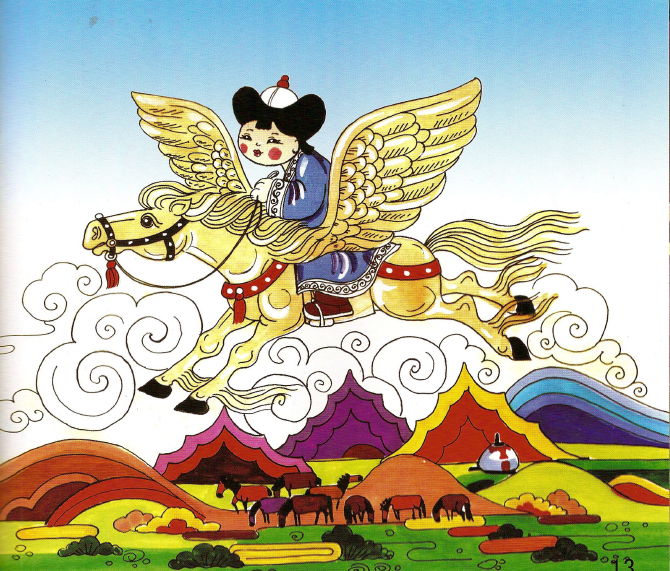 I think of Ernst who travels in my heart. I take no foto. The clicking would disturb the solemnity. 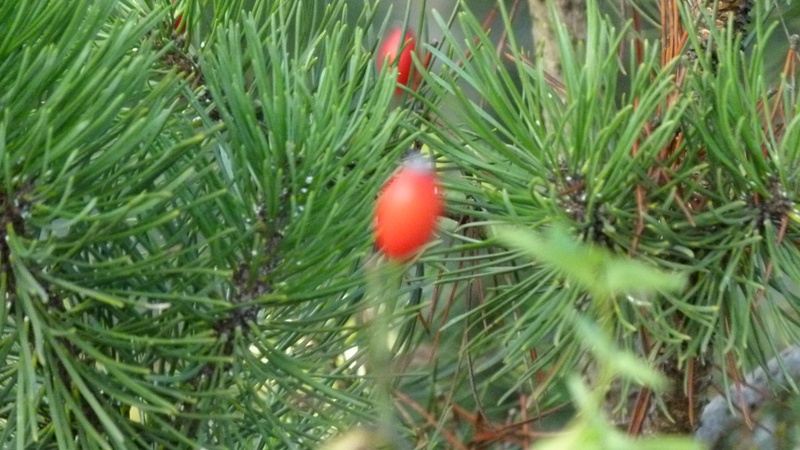 A botanical garden in November? Well I like November gardens. The plants have retreated, only few flowers are left and nature is recovering to prosper again next spring. 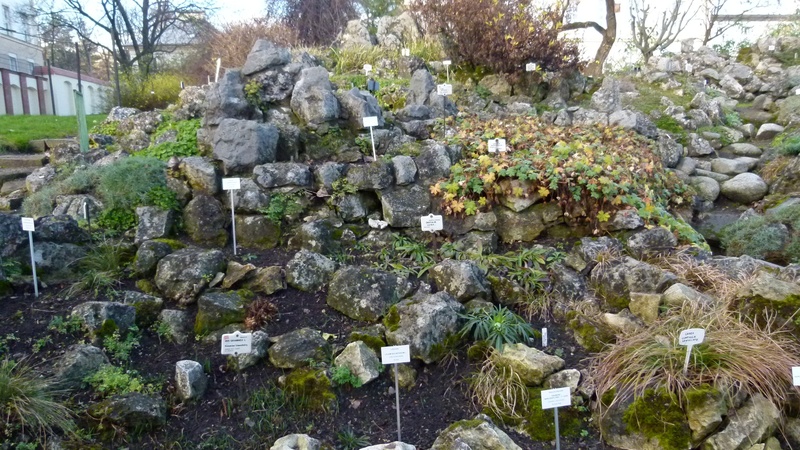 I can see, how carefully the plants from different regions are set up and labeled. 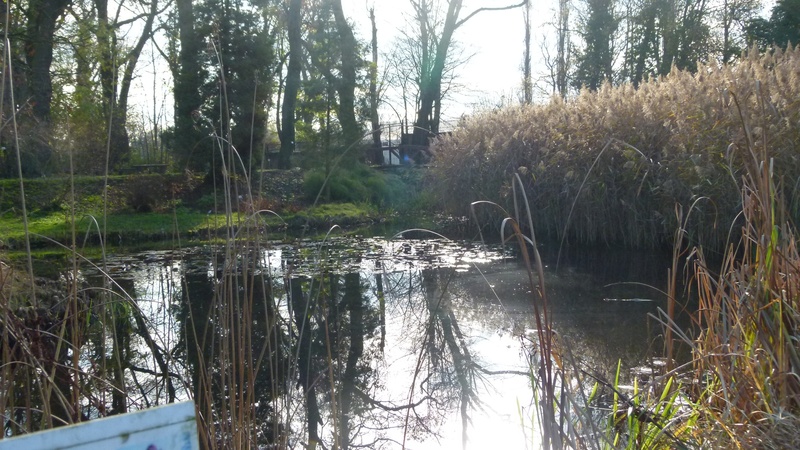 And I catch a few sad-romantic moments at the pond, where reed and trees are reflecting in the water. But then, the gate is locked, when I want to leave. The gardener murmurs that this garden is closed and I understand the word “pokasac” (or similar, meaning “show”). We walk back to the gate and she shifts a small and hidden handle away to open the gate. Then she closes it. This garden is not open for tourists now. 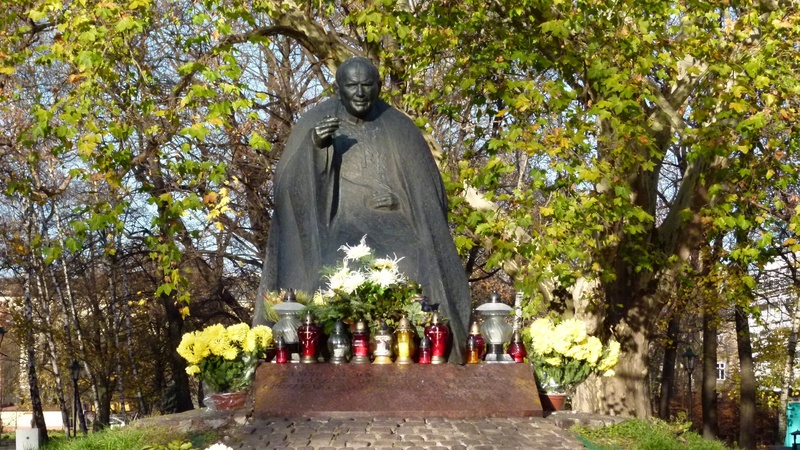 The memory of Mongolia, so far from here, seems to stay alife all over in Kraków, not only with the tune of the trumpeter that ends abruptly (as the Mongolians have killed him at this moment) or with the Lajkoniki that celebrate the victory in the 13th century (Kraków defeated the Mongolians much earlier than Moscow). 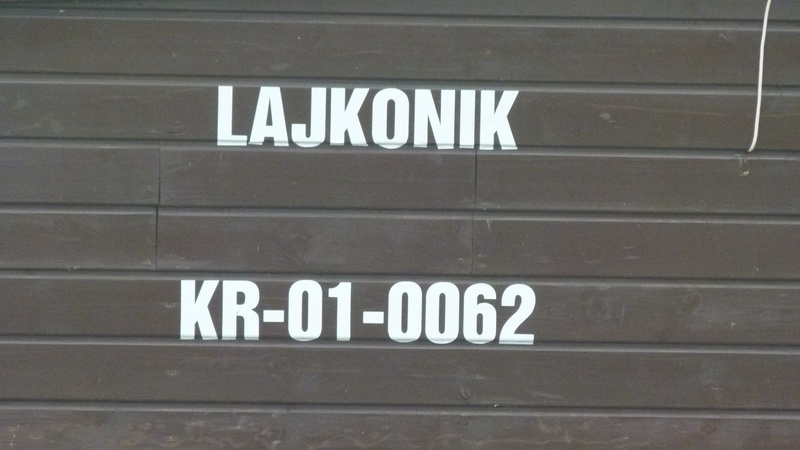 The Krakówians also name a huge and busy Rondo after them, the Rondo Mogilskie. Trams are crossing in a large round pitch that is overlooked by the ugly silhouette of a building from the 80’s – then praised to be the beginning of a new Manhattan. 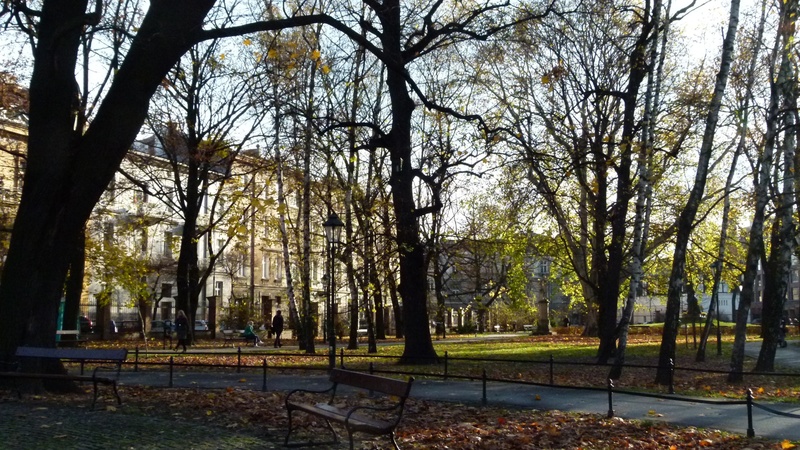 I flee the busy Rondo and the busy streets leading to it, and I head to the quiet Ulica Topolowa and the garden of Strelecki. Here I can say hello to the Pope that came from Poland. He is venered, as the many flowers show. I can understand that. 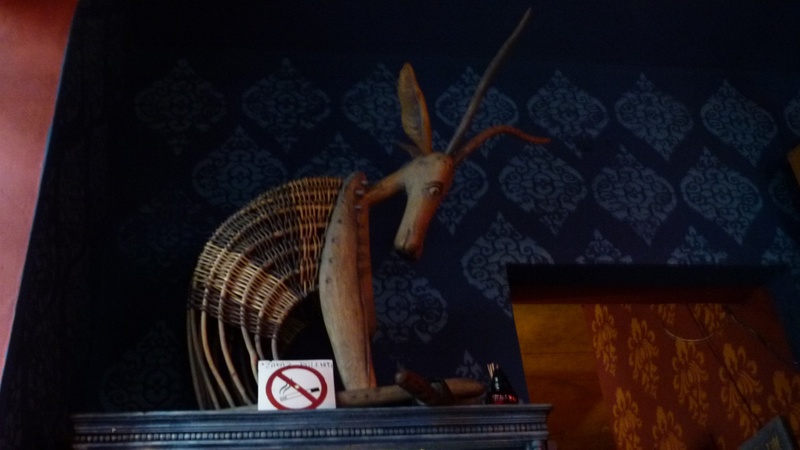 Back to the Rynek, I enjoy a tomato soup in the friendly bar of the Hippolit museum and write my blog. The white and black cat of the house shares the table with me.